This topic contains 1,569 replies, has 100 voices, and was last updated by Vampyrist 2 days, 17 hours ago. 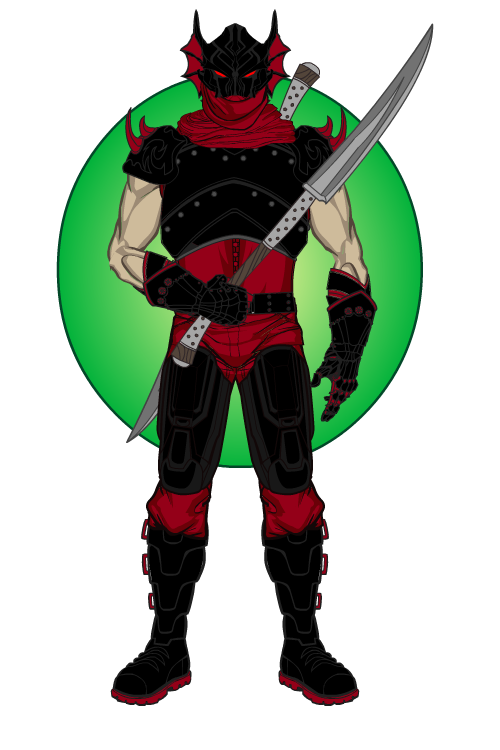 The mercenary/supervillain for hire known as Polyphemus has the ability to fire lasers from his eyes. He is a professional, not known for chasing down heroes or having grudges, just getting in and getting out while achieving his task. This reply was modified 8 months, 3 weeks ago by Vampyrist. This reply was modified 8 months, 1 week ago by Vampyrist. Here is Verrada the shade. In my fantasy universe, Shades are beings which have fused themselves with spirits to attain power. Verrada was a great warlock who always desired more power and to get it, he melded himself with the spirits/demons he summoned. With this, he gained immortality and great magical power. He likes to advise manipulable rulers towards war and chaos while also creating the conditions for these ends. 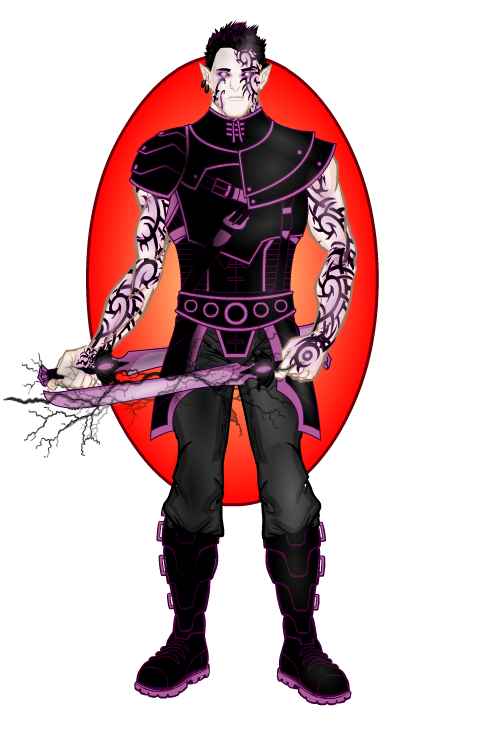 He revels in watching as kingdoms fall due to his machinations and destroying others with his magic. After both sides have destroyed themselves, Verrada makes sure to kill whoever is left so he can continue his twisted games. This reply was modified 8 months ago by Vampyrist. 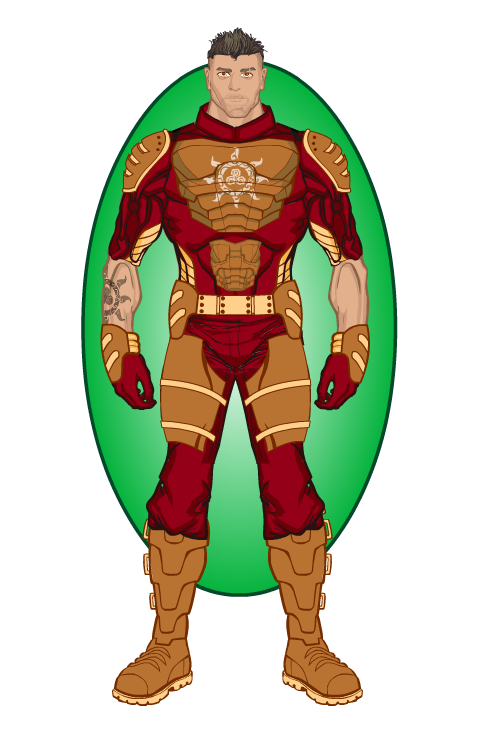 Here is Hector Hernandez, the hero known as Heatwave. Hector has the ability to manipulate heat which he uses for a variety of effects such as a heat ray, melting opponent’s weapons, heating up his surroundings to exhaust his foes and blasts of hot air which knocks the wind out of enemies and have some concussive force. This reply was modified 7 months, 1 week ago by Vampyrist. 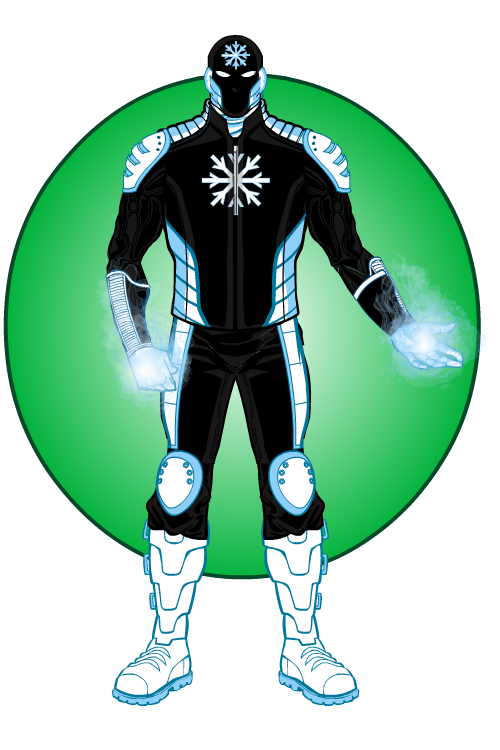 Here is Blizzard or Brian Hernandez, Hector’s adopted brother who has the ability to freeze things and create ice constructs. He is also Alpha’s best friend and partner in BSH. This reply was modified 6 months, 3 weeks ago by Vampyrist. I’m back to finally post something after lurking for the last couple months. Work and other hobbies has kept me from machining, but I figure its time I get back into it. Here is Schroeder, a man who is unmoored from his own dimension. Every universe has a unique frequency at which matter vibrates within it. For an unknown reason, Schroeder’s frequency became out of sync with his own universe so he shifted into another dimension. He remains in the dimension until he is so out of sync that he shifts again. His stays last anywhere from a day to a year at the most, averaging a couple weeks. This is usually enough time for him to get in adventures and help people. He eventually learned how to master his phase difference to teleport within a dimension, though this can destabilize him further. 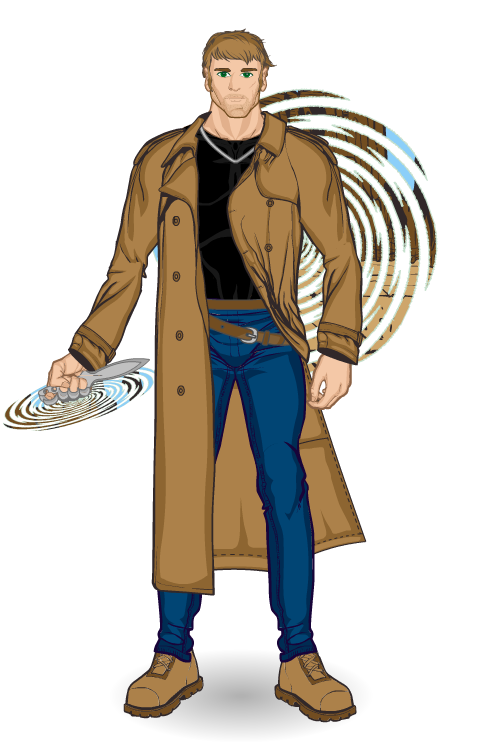 He uses a set of brass knuckles/knives to focus his teleportation. This reply was modified 4 months, 2 weeks ago by Vampyrist. Hey you got some pretty cool dudes! 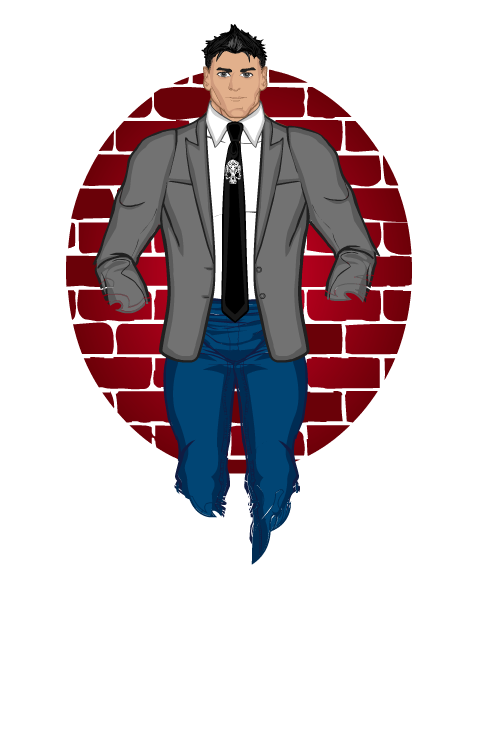 could you tell me how I could improve on this character? Thanks! In general, if you’re looking for critique/advice, you may get more responses from making your own thread and posting your creations there. For my two cents, I’d say placing a circle insignia behind the bowl but in front of the neck so that his neck wasn’t showing would be a good place to start. Other than that, it’s a good start. It’s been a little while since I last posted, work has kept me somewhat busy and I just haven’t found the time to create. Here is Schroeder a couple of years older where he now goes by the name, Traveler. He has experienced more and is more cautious, less likely to jump in and attempt to solve every problem in every world he encounters without a second glance. He also tends to use his skills and knowledge rather than his powers and fists to help others. This reply was modified 3 months ago by Vampyrist. Here is Pirouette, a french-american assassin who can control a liquid metal around her extremities. 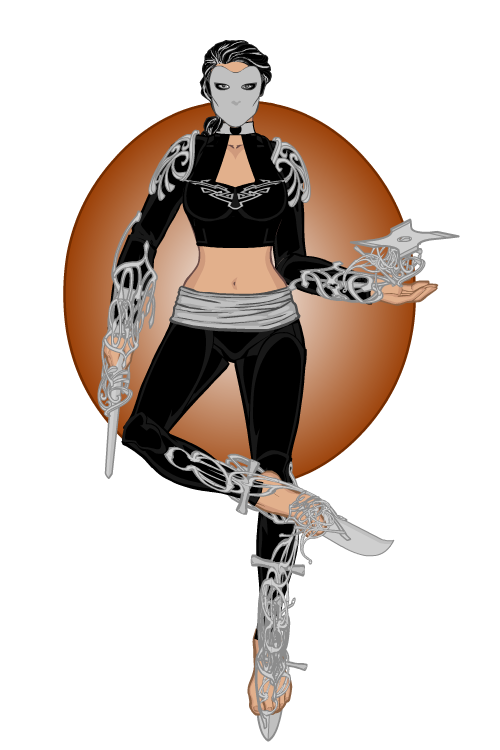 She is also a skilled ballet dancer, combining her dance with blades for a deadly combination. She was once Titan’s girlfriend and part of his group which often clashed with the Cadets. Since Titan has returned from his time in the gladiatorial planet, she has been trying to seduce him back into a life of crime, much to Psyche’s dismay. This reply was modified 2 months, 3 weeks ago by Vampyrist. Here is Jesse Cardenas, former student of the Institute turned teacher. He teaches both English and Combat. 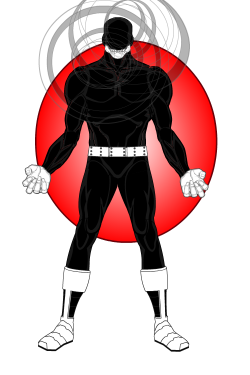 Jesse’s father was the super thief/villain Spectre and Jesse inherited his father’s ability to become intangible, though Jesse was later able to become invisible while intangible. Jesse and his mother left his father when they found out about his dual life. His father still loved his family and spent a good deal of his stockpiled cash trying to find his family to little success. They would eventually be reunited when a group of villains, including Spectre, invaded the Institute. 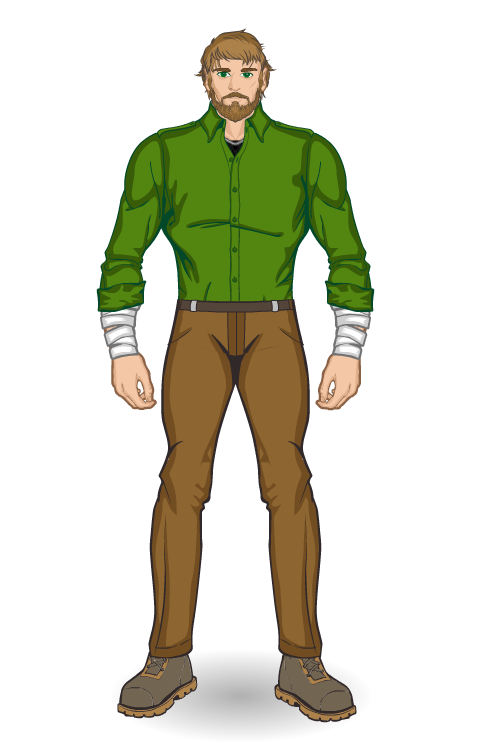 Many students died in the attack and Jesse was integral in bringing down the mad Jack. He later found his father there trying to steal technology. Jesse managed to convince his father to help him stop his comrades and eventually turn himself in. Jesse is a quick thinker, his abilities giving him enough time to formulate plans on how to tackle whatever obstacle is in front of him. He would eventually fight crime under his dad’s moniker, Spectre, trying to redeem the name. 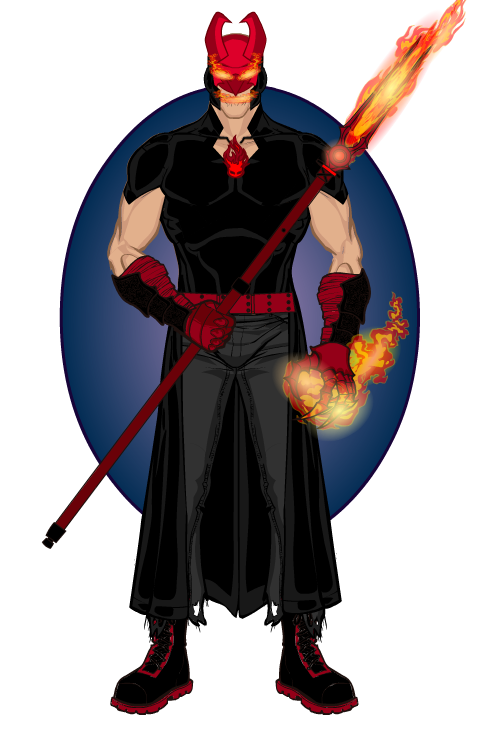 Here is Diablo, a mexican supervillain whose bident allows him to control fire. Here is Kappa, Alpha’s younger brother and clone. 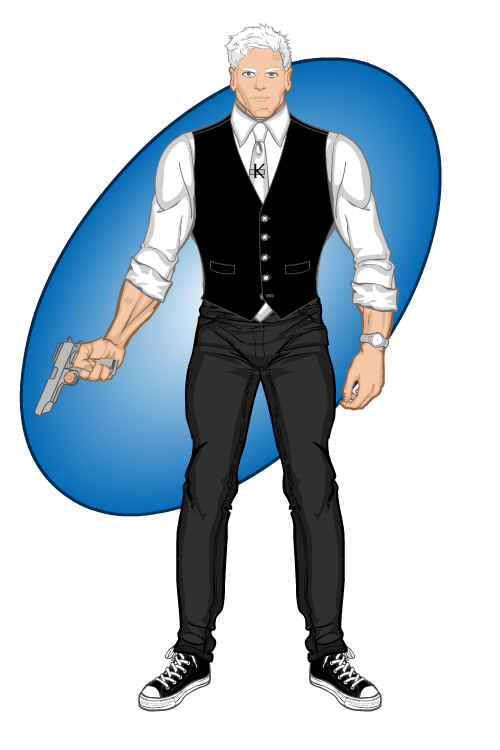 He was shot and killed by a villain and brought back by his BSH partner who is a reality warper by wishing he was Alive. Because he was brought back the way he was, he is now immortal and can see possible futures. He gained the latter as it is a way to comfort the spirits in the afterlife that their loved ones will be alright. They gain the power to see likely futures and know if their loved ones will be happy. Normally, when one is resurrected, magical safeguards are in place to wipe this ability. However, since he was ripped so suddenly from the afterlife, the ability could not be removed and burned itself into his soul. 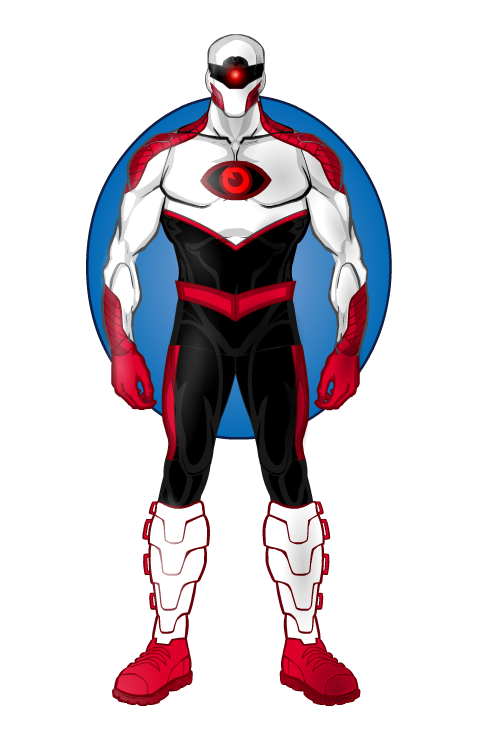 Because he could now actively influence the present, the ability went into overdrive and his hair and eyes turned white. While it could not be removed, they were able to limit it to his own immediate possible futures and give his brain the processing power to handle this. 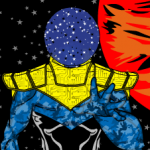 The immense mental strain of this has also prevented him from using the scanning feature of his powers and he can only summon what requires the least concentration, AKA what he summoned the most in the past. As he is unable to die and his existence is constant pain, he has become suicidal and has begun to hate the world. Despite this, he still occasionally will help people, using his foresight to save lives. This reply was modified 2 months, 2 weeks ago by Vampyrist. 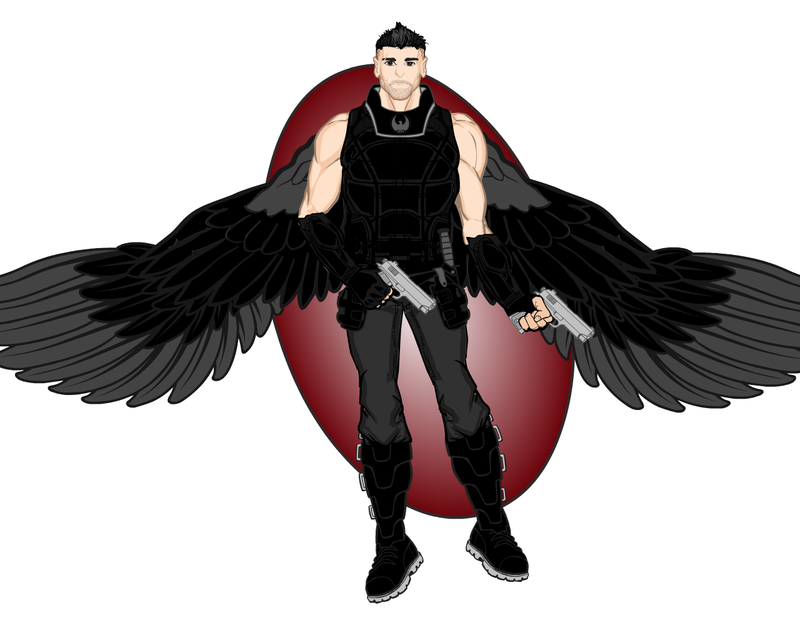 Here is Adrian Cross, a former student of the Institute who has 2 black wings. The wings’ feathers are nigh invulnerable and can be launched as projectiles. 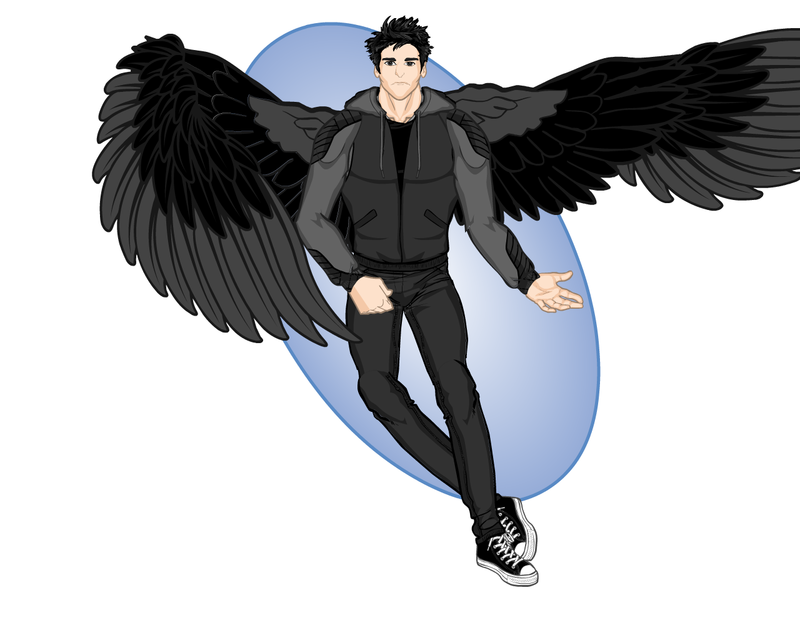 The wings are also prehensile enough where they can be used for attacks or for shielding Adrian. Adrian initially was not too social at the institute as he was the genius loner type. He was one of the better students at the Institute and one of its best strategists. He had a tendency to be blatantly honest, cold, and tended to think logically and pragmatically. This did not win him many friends, though he was friends with Connor Smith, who is secretly the trickster spirit Coyote. He was accepted by more people after he came up with a strategy to take down several of the villains attacking the institute. 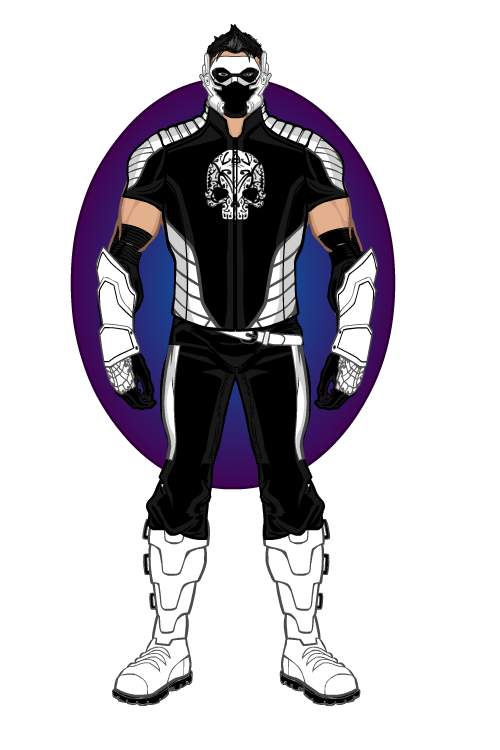 The government saw his powers and gifted mind as an asset and he was recruited to join the black ops team SPARO. He has risen up the ranks and is usually second in command in the field. When he is not with them, he fights crime as Raven. Here is the villain Mandible who can control sound. He often works for the Black Rose.